Mountain biking in the snow during the winter when it is cold can be a lot of fun. It certainly beats staying in doors and off your bike. More riders every year are venturing out during the winter. The riders who are most successful at it during the cold months of the year are the ones who are most prepared. Here are my tips to help you get the most out of winter riding. If you want to avoid going no where fast then you need to get winter bike snow tires. These tires are wider and have larger knobs. Plus the knobs are spaced farther apart. These tires will give you a lot more grip when you are riding through the snow. Also, because you have more grip, you won’t have to work as hard to pedal. This will help you to stay dry and not sweat so much. Sweating a lot while riding in the cold can make you even colder and it may eventually end up making you sick. If your tire pressure is high or too hard then you will be bouncing around on the trail. Lowering your tire pressure will help to keep more tire on the snow. If the tire pressure is higher then less tire will actually be touching the snow. You only need to reduce the tire pressure by 2 or 3 psi for it to make a difference. You will have more traction for when you are riding in deeper snow. More traction means you will be able to keep moving forward without slipping or sliding. It is no fun getting stuck in one spot. Studded tires will break through the snow and onto the ice if there is ice underneath. This will give you great traction. When you are riding on a snowy trail and an unexpected turn pops up the studs on your tire will save you from wiping out. Studs on tires can range from 120 studs to 300 studs. These types of tires are narrower than fat tires and regular snow bike tires. This again is so it can break through the snow. Studs are made of hard carbide which lasts longer than steel. These tires are also heavier, helping you even more to gain traction. A fat tire bike is a mountain bike with over sized tires. These tires are wider with larger knobs which have more space between them for more traction. Fat bikes are especially good for riding on snow. Wider tires make more contact with the snow giving you better grip. Unlike other tires, you can lower the psi of fat tires to around only 6 psi for snow conditions. Because you can lower the psi so low it does not matter how snowy the conditions are. For fluffy snow keep the psi low. When the snow is not as deep or the snow is harder you can then raise the psi. If you are currently using clipless pedals take them off. Instead use flat pedals. You don’t want to be messing around with frozen or snowed in clips. It will be a real pain having to always stop and take away the snow that has built up on your pedals. Plus it will be safer to use flat pedals when riding in the snow because then your legs and feet will be free. You may need to kick out your left or right leg in order to keep your balance when going over more difficult snowy terrain. This relates to using flat pedals. By lowering your seat you can quickly touch the ground with your feet when you need more balance. Your weight will also be more centered with the seat lower. This will help you gain more traction evenly for both tires. 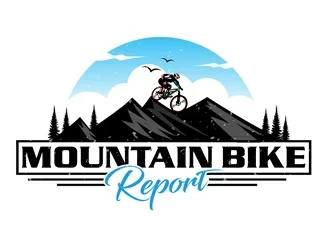 You will feel more grounded and comfortable on your mountain bike. Remember that super cool difficult, rocky, hilly trail system you love to ride on during the summer. The one where you did your best jumps, and made your quickest corners. That is probably not the best choice when there is snow on the ground. Try to stay on trails that are flatter overall. They are easier to navigate in snowy conditions. Take the lack of traction and use it as a learning exercise. Work on your technique. Such focus will keep your mind off of how cold it is until you really warm up. Then you can let loose a little bit more. You might think you need to change your riding style for the winter because you are imagining icy, slippery, snowy, wet trail conditions. But overall, there is quite a bit of grip especially when fresh new snow falls on to the trail. When this happens I find that I’m quite far back as I ride. I let my front tire bounce around a bit because I do not know what is underneath the snow, because the ground is all covered up. There could be a log, or a rock. If there is a big snow fall, there could be a large hole that I won’t see. In that case I could lose the front end of my mountain bike and get thrown over the front of my handlebars. So it is pretty much the same. The snow is like riding really loose mud like dirt. You get a lot of grip, especially if you have fat tires. So keep your style the same. It is not a good idea to fight the trail, and you can’t fight against your bike. Your bike is going to let you go where it wants you to go in the snow. If you are riding trails in your neighborhood and you are familiar with it, and there is a lot of ruts, just stay with the ruts. Even though there is snow on it. Don’t try to create new ruts because your mountain bike is like a train on rails. It is just going to follow these ruts in the ground. You just have to stay loose and don’t fight against it. If you start to fight it you will fall off your bike because your bike is controlling which way you go. A simple way to keep your head warm is to wear a small cap or hat on your head. Make sure the cap is lightweight and thin so your helmet will fit over it. For warmth choose a cap which is stitched tightly, this will keep the heat in better than a more loosely stitched cap. You may want to try wearing a snowboard helmet instead of a mountain bike helmet. I have tried this and it works great. Snowboard helmets have vents that have little sliders so you can adjust how much ventilation you have. I find this type of helmet fits better over my cap and it is much warmer because it comes with flaps that come down and cover your ears. That is the worst when my ears get really cold. The flaps work great and they don’t fly up as I pick up speed. Not keeping your feet properly protected can lead to frostbite. If you are using clipless pedals then wear 45 North Wolf hammer mountain bike boots. These will keep your feet nice and warm up until around 15 degrees. When it gets colder than 15 degrees, trying putting in some hand warmers along the top of the instep of the boot. This will keep your feet warmer longer on those colder days. If you are using flat pedals, then wear a pair of good old fashioned work boots. Make sure the boots have a good heel. This will help you to stay more fastened to your pedal, by using the heel of the boot to push forward on the pedal. Bar mitts are what they sound like, mittens for your handlebars. They fit over each handlebar and are great for keeping your hands and forearms warm. I find them to be very comfortable to ride with. They are quick and easy to install on to the handlebars. Along with the bar mitts try wearing work gloves. For the winter I don’t use bike gloves I prefer to use work gloves which I can get at Home Depot. They are less expensive and they last a long time if not longer than bike gloves. I’m able to ride in these along with the bar mitts and be comfortable and very warm. As you go down hill and increase your speed going through winter conditions can really increase the wind chill temperature on your hands. Your fingers are right in line with the wind. Coming from the enduro motorbike world are hand guards. These hand guards will protect your hands from the wind chill created when you go forward on your mountain bike. You just fasten them on to your handlebars and adjust them so they are right in front of your hands as you grip the handlebars. Not everyone likes to wear big thick winter gloves for riding their bikes. This is because they don’t get a good secure feeling when they grip the handlebars. When choosing bike gloves, be sure to select ones that have a thin palm and a thicker front. Gloves with a thin palm will allow you to grip the bars better. Plus the palm area does not lose too much heat because it is gripping and flexing as you hold the handlebars. A thicker front of the glove is important because your fingers and the top part of your hands will be most effected by the wind chill. A balaclava or ski mask is really good to use on snowy rides. They cover your entire head and your neck. They really keep you nice and toasty. It is very important to keep your head warm along with your neck, nose, and ears. A balaclava covers all of them. The balaclava can also generate it own heat, with your help. Another are the balaclava covers is your mouth. As you breathe in and out your warm breath will be captured by the balaclava. This will help to keep your face warmer than if you just expelled your breath to the outside. Goggles are a good idea, especially if it is snowing down on you as you are riding on the trail. You want to be able to see as best as you can. There is nothing more annoying than riding your bicycle and squinting because there is snow flying around in your face and into your eyes. If you wanted you could wear sunglasses, but they will probably fog up on you. Plus they are more likely to fall off your face. Goggles on the other hand will not fog up, plus they will stay on your face. They will even keep your eye area warmer than sunglasses will because they are more air tight. Wearing clothing that is made of Merino wool is a great way to stay warm when the temperatures drop in winter. Merino wool has the ability to trap in air between its fibers. This is a great insulator against the cold. Wear merino clothing as a base layer against your skin. Eventually when your body does heat up after riding for a time, the moisture will be allowed to evaporate. This will prevent you from sweating a lot and catching a cold. It does this through a process called wicking. Your skin stays dry as your sweat is actually moved through the fiber and then evaporated out into the air. As we know already staying warm is very important when we are mountain biking in the snow. The best way to do this is to wear many removable layers. This allows you to adjust your bodies temperature throughout the ride. In the beginning of your ride you will be cold as ice but as soon as you climb up that first hill you may be over heating and sweating a little. It is better to leave your winter jacket at home and instead use a lighter wind proof, waterproof jacket. You may want to try bib shorts long as a base layer. They are very thermal and thick. They will keep your legs warm and they run from your belly button all they way down to your feet. Then on top of that layer put on a long sleeve thermal t-shirt which will keep you nice and snug. If it is really cold you can just keep adding as many layers as you need depending on how resilient you are to the cold. Waterproof and windproof outer layers are best. When you remove layers only remove middle layers. You want to keep on the base layer. Eventually after you have been riding, you are going to get hot. Then you will need to take off a layer or two of clothing. Where are you going to put it, put it in a backpack. This is an easy way for you to carry your layers of clothing. Whether or not you take some layers off or put some back on you have a place to keep them. Try to choose a backpack which is not too large. You want to carry only what you need in your backpack. If your backpack is too big it will feel uncomfortable on your back. Choose one so that everything fits in rather snugly, but only what you need. Making sure your body has enough fluids is important anytime of year. But it is especially important during the winter. The the winter and in cold weather it is easy to forget about drinking liquid. This can cause your body to become dry. I usually get headaches if I don’t have enough water. Be sure to fill your hydration pack with something hot, like water, tea, and or coffee. You may also want to get an insulation cover for the hydration pack as well as the hydration tube so the liquid does not freeze. If you don’t want to get an insulation cover or you don’t have one, here is what you do. After you take a drink from the tube blow back all the liquid into the hydration pack. Now there is no water in the tube which can freeze. Another thing you can do is keep the tube on the inside of your jacket. The tube should then heat up any water in the tube to near your body temperature. That heated water will keep any other water from freezing up. A good way to warm up your muscles and your body for a day of riding in the snow is to begin by going up a hill. You are fresh and full of energy so this is a good time to use it to heat up your body and muscles, and get the circulation going. If you start off on flat trails you may not become fully warmed up. If you continue on flat trails for a time you may actually get colder. It is better to get warmed up first then need to warm up later after being cold. Warming up first will keep your hands and feet warm longer. If and when you do get cold your hands and feet will be the first to become cold. Cold hands will reduce your handlebar control, and cold feet are never fun. It is easier to ride in the snow when the snow is harder. You will find the hardest snow in the morning after a full night of lower temperatures. 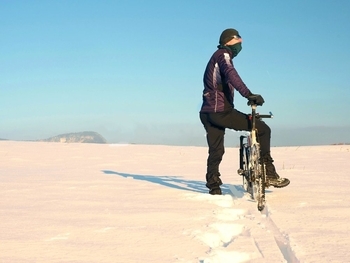 Hard or frozen snow allows you too keep your bike on top of the snow. This makes pedaling much easier and it is easier to coast over the snow. Later in the day the snow will melt a little after the sun has been shining on it. This will make the snow softer and more difficult to pedal through. You will have to use more energy to move forward. On the day that snow has fallen, snow is usually light and fluffy. This makes it very easy for your bike to sink right into the snow. Pedaling becomes more difficult. Wait a day or two in order to allow the snow to become harder. Also, wait for other mountain bikers to do the work for you. Let them cut through the snow first so that they make bike tracks. These bike tracks will be made after a day or two and will be clearly seen by you when you start biking on the trails. Now your ride will be that much easier because you can follow the bike tracks of other riders than came before you. No matter what kind of snow conditions you are riding in, you need to pay attention to your pedal power. Pedaling with any sharp explosive movements can be risky. One pedal stroke that is too powerful along with your bike tires at a vulnerable angel could land you and your bike in the snow. Every pedal stroke should begin by applying pressure to the pedal gradually. Once you get through the initial push of the stroke, then you can apply much more pressure on the pedal. This is especially useful in deeper snow. Snow which is deep and light, you can pedal through it while remaining seated, but I suggest keeping your seat a little high. If your seat is dropped all the way down, then depending on your leg length you may be muscling each pedal stroke. This is more difficult and will make you tired. If the snow is deep and compact but you can’t ride on top of the snow. Then you should lower your seat and stand up as you pedal so you get the most power with each pedal stroke. Staying seated will be too difficult to pedal forward. With your seat lowered and out of the way you will have more balance when you stand and pedal. When riding over ice or slippery icy snow you need to pedal more gently. Pedal gently and slowly, any sharp pedal movements will be risky. After each pedal stroke coast for a few feet before continuing with your next pedal stroke.